Home English Jersey first look: Nani gets ready for batting! 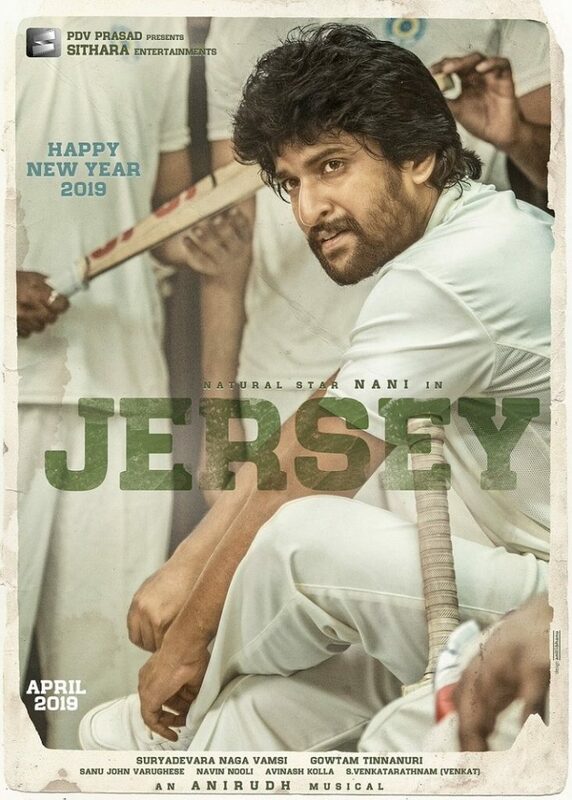 Jersey first look: Nani gets ready for batting! Nani’s first look from Jersey has been revealed on the eve of New Year. Nani plays a cricketer who is Ranji player. The film is set between 1986 and 1996 period. Nani’s retro looks in the poster gives a nostalgic feeling. It was the golden era of Indian cricket with Sachin Tendulkar at peak of his career. Nani shares that he plays a 36-year-old Ranji player who dreams big but had his share of heartburns. Gowtam Tinnanuri of Malli Raava fame is directing this sports drama. Suryadevara Naga Vamsi bankrolls the film under Sithara Entertainments. Anirudh Ravichandran’s music will be highlight of the movie. It is his next after Pawan Kalyan’s Agnyaathavaasi in Telugu. Shraddha Srinath plays Nani’s love interest in this movie scheduled for April release.